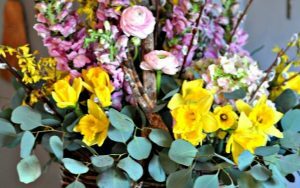 Join The Flower Room Essex to create an Easter basket arrangement! All the flowers, materials, tea/coffee and cake will be provided. The workshop will be held in The Artist Studios, at The Stables. The class will be smiles and creativity all round - with step by step tuition. Beginners are welcome and places are limited so book now to avoid disappointment!